← Mona Pisa Donut: Another One of My Favorites from J.CO! 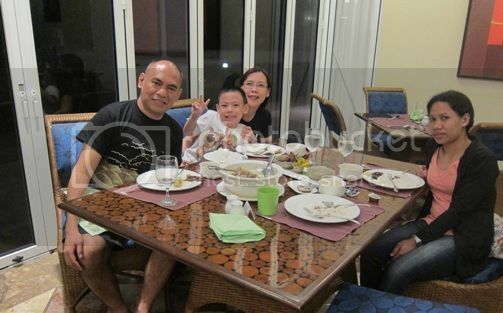 We were in Cebu from June 4 to June 6, 2012 for a very short vacation, and we stayed at Imperial Palace Waterpark Resort & Spa. 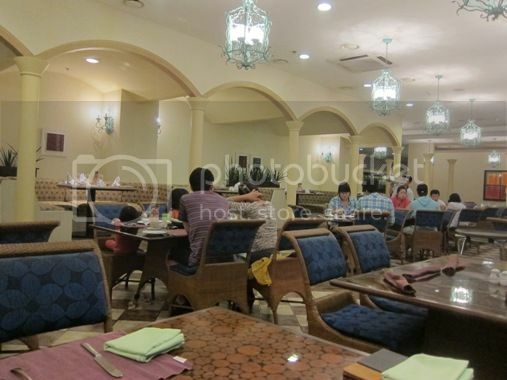 We had a hard time deciding where to eat on our first night at Imperial Palace because there were 8 restaurants inside. We finally chose to have dinner at Café Amiga. Café Amiga “serves a variety of exotic and unique dishes of Filipino, Thai and Southeast Asian cuisine origins, as well as international and continental menus.” It has seafood and grill sections, pasta, sandwiches and salads. We had Beef Pochero and Chicken and Pork Adobo for dinner. One thing I noticed about their Beef Pochero was the clear color of the soup, which means that the meat was not cooked in tomato sauce. It actually looked like Beef Nilaga (Beef Stew) to me. 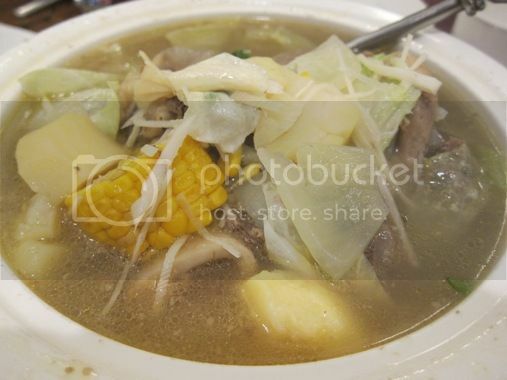 This Beef Pochero had beef shank, potatoes, fresh bamboo shoots, sweet corn and white cabbage. We loved this! The big bowl of Beef Pochero that they served us had a generous serving of beef and vegetables. 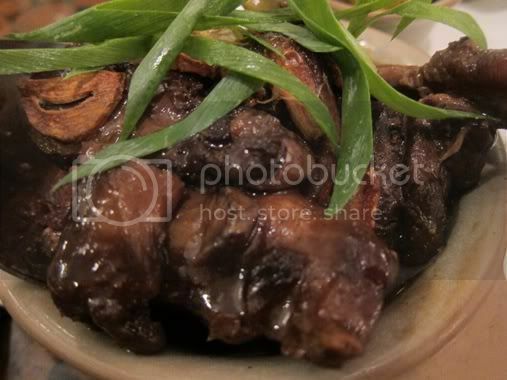 The beef meat was tender and flavorful. Had we known that the serving was huge, we wouldn’t have ordered another dish. This was probably one of the best-tasting chicken and pork adobos we’ve had. It wasn’t too saucy but not dry. It was also not too sweet and not too sour. In short, it was seasoned perfectly. What’s different about this chicken and pork adobo is that they used soya vinegar instead of the usual vinegar. Our dinner was delicious! We were so full and satisfied, and I think I’ve gained weight for eating more than my normal carbohydrate and protein intakes. Sigh! 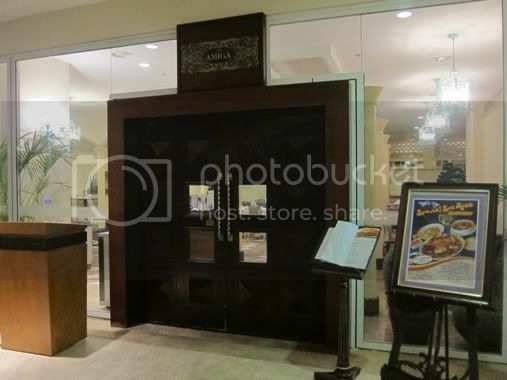 This entry was posted in Cafe Amiga, Continental Cuisine, Filipino Cuisine, Imperial Palace Waterpark Resort & Spa, International Cuisine, Southeast Asian Cuisine, Thai Cuisine. Bookmark the permalink. the pochero seems perfect for the weather! this hotel has an impressive building and grounds, wala nga lang beach. perfect for families with kids. i was surprised the first time i had Pochero in Cebu, it’s a different pochero than what we cook at home. :p i like the corn and saba. That should have been a perfect vacation just before the classes will start. Visiting from FTF. aside from being delicious, the servings are quite big too!! I like the pochero…looks delish coz I love soup 🙂 Dropping by from FTF. i would also like to visit Cebu and this share is helpful just in case we drop by here.